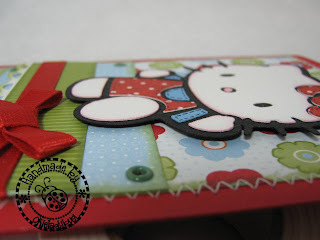 Red is my favorite color so of course this is going to my favorite Hello Kitty card that I did! *okie really thinks the next two are stinkers but will post them anyway* I like the colors, patterns of paper and the design of this card. I rarely say I like things I make but this one I do. The pattern papers are Stampin Up as is the cardstock. The polka dot some scrap I had *okie so loves polka dots, maybe because they are round like her*. The border punch is also Stampin Up. I wasn't sure about a sentiment but found one that I thought was okay. It says "We know we are getting old when the only thing we want for our birthday is not to be reminded of it." I don't think I am old quite yet, but I could careless about my birthday. I have never been big on celebrating my birthday but since Jesus has his birthday two days later and I just figure it would be hard to compete! Again I did some stitching but I am sure by now you guys are NOT surprised! LOL I used some 3/8" ribbon that I got at Walmart for the bow and strip. My Walmart does have some nice ribbon but I still prefer to order from Ribbon and Bows Oh My! because of their prices and selection. I did do 3 layers of paper on the card mat alone and I think the layering of papers really adds to cards and layouts. The eyelets are some I got from Eyelet Outlet. I love their prices and their shipping is super reasonable! I think one time I ordered almost $40 in product and the shipping was a little over $3.00. If you do go check them out make sure to check out their clearance! They always have wonderful items in their clearance. I get most of my shaped brads from them. I don't think I have said before but all the Hello Kitties are pop-dotted on the cards. You guys know how well I love my pop-dotting! And if you are new to the game and don't know I do have a video on how to MAKE YOUR OWN POP DOTS. It is a lot cheaper than buying them...fo' sho! If you would like to make yesterday and today's cards you can download the files. I love this card too Okie, the red just is perfect. Cute, cute, cute! I love her. I love your card...I just love to see what you will come up with next. HaHa- maybe that is why I like polka dots too. Never thought of it that way!!!!! Okie, this is just the cutest card! Love the colors! Red and polka dots pretty well HIT the spot for me, too! 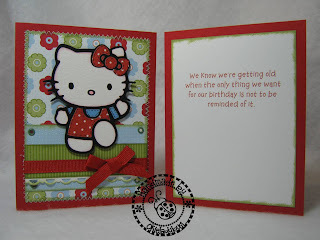 LOVE this darling card, and am so happy that your are doing this cart, as I just bought ti at JoAnn's. Thanks so much for sharing! She is so cute. I can't imagine anything you creating being a "stinker". 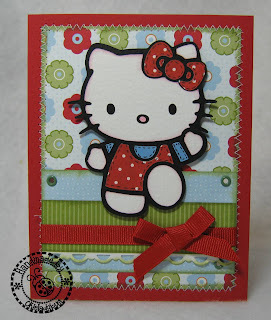 These Hello Kitty cards are so dang cute, and I agree, all the details (layers, stitching, eyelets, inking, pop dots, etc.) really add to the cards and make them extra special. You are really making me want to go out and buy this cart. :) Love ur work!